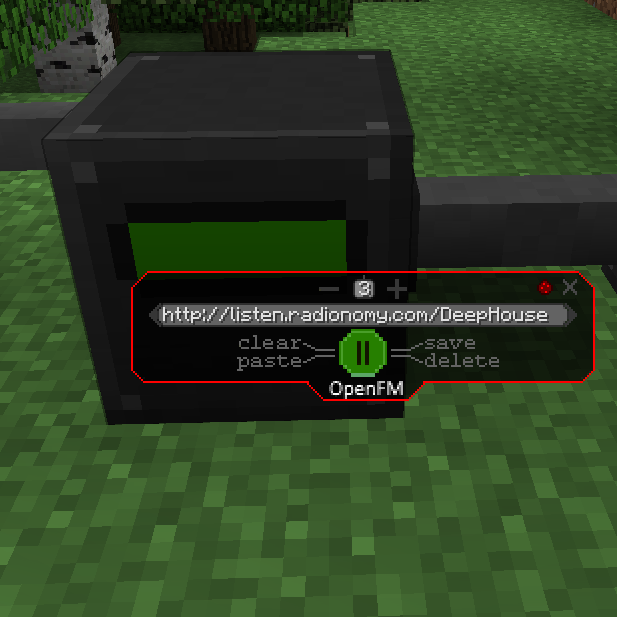 how to add radio stations or urls to radio? Type them into the URL box on the GUI, and hit "Save" it will add them to the "Favorites", then you can cycle through them with the arrows on either side of the URL box. I noticed in the spotlight video it showed a numerical IP, could this mean there is a way to stream music from say Winamp on someones computer through to OpenFM? I ask because I remember what SHOUTcast was like back a few years ago but it seems to have changed A LOT. You need a streaming source, the IP was just the IP to a shoutcast or icecast station. Will there be a 1.8.9/1.9 port? There was a 1.8 release, but it's broken and causes crashes. I can't fix it, and I can't find anyone willing to help. Would be glad to help if needed. PM me and we can talk there if you still need help. Work has resumed on the 1.8.9 port! 1.9 and 1.10 will follow. Just wanted to make sure you knew, 1.8.9, and 1.9.4 (1.9.4 seems to work on 1.10.2) versions have been released)! Please add the mod in Russian language translated by me version 0.1.0-33, link here http://pastebin.com/wJNnM5hU. Thanks for the mod. Your translation is not entirely correct, because in Russian language only own names, and first word written with a capital letter! Th bank was closed during the night and radio shutdown too. Implemented a temp fix for this in build 5, will be up as soon as Curse approves it. So i what URLs are suitable for reading? I want to setup custom music list with periodical announcing, does it possible? Pretty much all http://Radionomy.com streams are supported, as are most of the streams you'll find on http://www.shoutcast.com/ (A lot of these are radionomy) Others will work too as long as they are MP3, or OGG streams. You can run your own Shoutcast/Icecast server and broadcast your own stream as well, I do this from time to time myself, though I'll offer no support in the server setup. 2.) Click a category (and sub-category if needed, once main category is selected) to the left. 3.) Click the radio station thumbnail of a stream you like. 4.) Right click "Listen to this radio station in your media player". 5.) Left click Copy Link Location (if using FireFox). 6.) Open new tab and paste in the URL you copied. 7.) Trim off the .m3u in the URL then hit enter (so it fixes proper case sensitivity of the direct station URL). 8.) Copy new modified URL if radio station plays correctly. 9.) Paste new modified and case-fixed URL in-game.